Michael and Richard Antonorsi, two engineering alumni who parleyed their degrees for jobs in the technology industry and later crated Chuao, a gourmet brand of chocolate, are profiled in the BrandVoice section of Forbes' website: http://onforb.es/QrbEBh The brothers earned degrees in bioengineering and computer science in the mid-1980s here at UC San Diego. 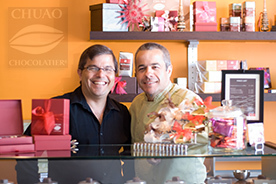 The Forbes story calls Chuao "a national player in the super-premium chocolate-bar market." The chocolate bars, with exotic flavors such as maple bacon, are now sold at about 2,500 locations around the country, including major retailers like Whole Foods. If you're on the UC San Diego campus, you can also find them at several locations, including the Sunshine Store in the Price Center. To learn more about the brother's journey to chocolate fame, read this story in This Week @ UC San Diego. 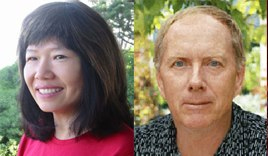 Ron Graham and Fan Chung Graham, two professors in the Department of Computer Science and Engineering at the Jacobs School, have been named to the inaugural class of Fellows of the American Mathematical Society. The program recognizes members who have made outstanding contributions to the creation, exposition, advancement, communication and utilization of mathematics. Both are experts in combinatorics and theoretical computer science. Ron Graham is past president of the American Mathematical Society (1993-94) and the Mathematical Association of America (2003-04). He is also the co-author of "Magical Mathematics: The Mathematical Ideas that Animate Great Magic Tricks." The book has received the 2013 Euler Prize. Fan Chung Graham holds the Paul Edros Chair in Comninatorics at the Jacobs School. Civil Engineering magazine interviewed Jacobs School Dean Frieder Seible at length for a feature on the school's new Structural and Materials Engineering building in its November issue. The building is home to the departments of structural engineering and nanoengineering, as well as to researchers from the medical devices group at the Institute of Engineering in Medicine, and to visual artists. The article details the building's features, including a performing arts space, a conference center, 60-foot long bridge and solar panels that can generate 140 kW of energy. It also details the building's contents, including labs, art studios and a massive robotics mill. Maurizio Seracini, an adjunct professor of structural engineering at the Jacobs School, and well-known "Da Vinci detective," spoke at TEDGlobal 2012 in Edinburgh this summer about "The Secret Lives of Paintings." His talk is finally available via streaming video on the TED website. The video comes with an interesting blog post, titled "That unicorn is really a lap dog: The secret details in 4 classic paintings revealed." Seracini leads several projects in Italy for the Center of Interdisciplinary Science for Art, Architecture and Archaeology, also known as CISE3, and located on the San Diego campus of Calit2. One of the project's goals is to find the long-lost da Vinci masterpiece, the Battle of Anghiari. Science magazine, published by AAAS, put together what looks like an interesting special issue on Biomaterials. If you're don't have a way to get behind the Science paywall, you can still access the special issue without paying...until Nov 30, but you do have to register. Engineers think about formulas and numbers, surgeons work with their hands, physicists focus on explaining materials behavior, and biologists analyze complex cellular interactions. They all work in biomaterials, but they often speak different languages and have different priorities. For biomaterials to move from the lab to clinical use, these groups increasingly need to work together. With this in mind,Science and Science Translational Medicine are covering the basic, the applied, and everything in between—the so-called translational space. What inspires you? Write it in a haiku! That was the challenge at the Jacobs School’s Founders’ Day booth. Below are samples of the creative writing work that took place over two hours Friday afternoon—engineering-inspired and otherwise. Visitors also could play a carnival version of Rutherford’s famous gold foil physics experiment—the first experimental evidence for the atomic nucleus. The game was designed by students from the NanoEngineering & Technology Society at UC San Diego. Researchers have discovered a way to harvest the power generated by a biological battery located in the inner ear to power electronics for medical applications. Patrick Mercier, who joined the Electrical and Computer Engineering faculty at UC San Diego Jacobs School of Engineering in July, said this natural battery could be used to power tiny, implantable electrodes that could monitor biochemical activities within the ear. This type of study has been difficult until now because of the risk of hearing loss associated with trying to biopsy the inner ear. Mercier said using the technology to conduct basic scientific research on the inner ear could lead to transformative new knowledge about human hearing. It could also be used to power drug delivery pumps for therapies for hearing loss patients. Another long-term implication is what this study says about the potential of low-power electronics. The natural battery in the ear doesn't provide much power, which is one of the reasons he said its capability has likely been left untapped since its discovery 60 years ago. That meant the researchers had to develop a device that didn't require much power to function. In an experiment with guinea pigs, the researchers were able to use their “low-power energy harvester chip” (pictured) to power a small radio transmitter without causing any damage to the guinea pigs’ hearing. A major thrust of Mercier's research here at UC San Diego, will be developing electronics that consume "orders of magnitude" lower levels of power. Mercier’s chip consumes approximately 1,000 times less power than a wristwatch, and approximately 1 billion times less power than a cell phone. This work was published Nov. 8 in the journal Nature Biotechnology. Mercier conducted this study as part of his doctoral research at MIT in collaboration with a team of researchers led by Konstantina Stankovich and Anantha Chandrakasan from the Massachusetts Eye and Ear Infirmary (MEEI), the Harvard-MIT Division of Health Sciences and Technology, and MIT’s Microsystems Technology Laboratories. Have a Green Idea? Ready to Commercialize It? If you are working on a project that will benefit the environment, and if you have have an idea of how to turn that idea into a commercially viable product, then next week's TriNet Mixer at UC San Diego may be for you...you's have the opportunity to win funding & business mentoring. 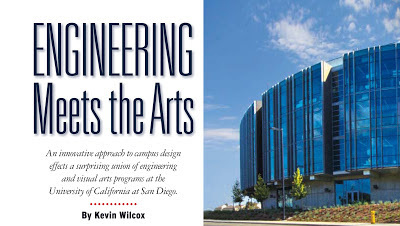 The event is on November 13, 2012 at the Jacobs School of Engineering, in the Qualcomm Conference Room. This is a von Liebig Entrepreneurism Center event. The goal of the Challenge, sponsored by the Scripps Foundation, is to promote innovation and commercialization within the three schools and provide entrepreneurially-minded scientists and engineers with the opportunity to develop and advance their technology's commercialization plan while providing an avenue for potential funding. The Challenge provides networking opportunities - bringing together scientists and engineers with entrepreneurs - and personalized mentoring by experienced businesspersons. The top three projects will also receive cash prizes. See flyer for more details. November 13th 2 pm - 4 pm: Come to the TriNet Mixer! Join us for pizza, snacks, and an opportunity to network with scientists, engineers, and entrepreneurs. See flyer. Startup Weekend San Diego is coming up...it starts a week from tomorrow...Nov 16. Curiosity Engineer Talks About "Seven Minutes of Terror"
NASA researchers called it the "seven minutes of terror:" the time difference between the moment when the Mars rover Curiosity would actually touch down on the red planet and the moment when the ground crew, on Earth, would find out if everything had gone according to plan. Brian Schratz, the engineer in charge of telecommunications during Curiosity's descent and entry relived some of these moments during a talk to the Jacobs School of Engineering Friday. He spoke to an audience of about 200 students, faculty and staff members at the new Structural and Materials Engineering building. He even brought props, including some spare rover tires, spare fabric from the rover's supersonic parachute and a miniature replica of Curiosity. "Mars is our best chance to find life itself...or its building blocks." On the importance of communications: the only thing worse than losing a Multi-billion dollar mission is not knowing why. Landing Curiosity while monitoring other Mars orbiters is like an orchestrated ballet. On landing day: it was just a really weird day when everything when the right way. On orbiter pictures of Curiosity: We basically made a mess of the surface. It's really cool to see where we are on Mars from something else than us. The landing was a mix of relief and worry: "Yes!" when something worked. "Oh no!" immediately after as engineers were worrying about something else. I didn't realize how far in the pond the ripples would go (from the landing). Study hard and come work for us!